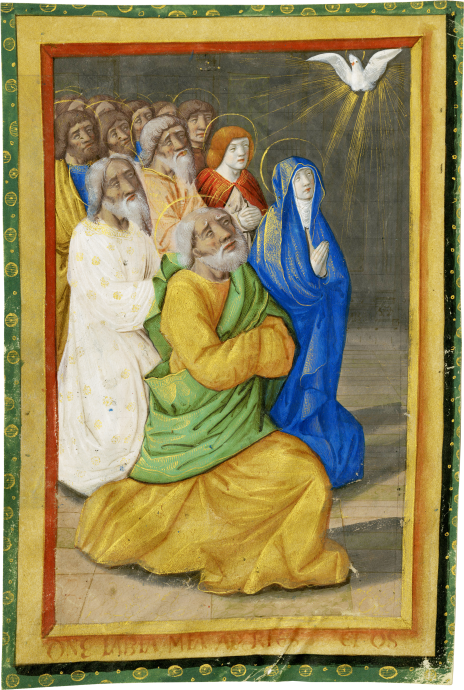 This full-page miniature depicting the Pentecost once opened the Hours of the Holy Spirit in what must have been a large and richly illuminated Book of Hours. The illusionistic picture space presenting the figures "close up" is often associated with Jean Bourdichon and Jean Poyer in Tours. The present miniature, however, was almost certainly illuminated in Paris. The composition and rendering of faces is evidently that of the Master of Martainville 183. It is immediately comparable to an attributed leaf at the Fitzwilliam Museum in Cambridge of the same subject (Marlay Cutting Fr. 13d). According to Caroline Zöhl, the renderings of the Virgin Mary and John the Baptist in the present leaf are closer in style to the enormously successful workshop of Jean Pichore (active Paris, c. 1490-1521); with further study this leaf might reveal new information on collaborations between these two groups, both producing Books of Hours in Paris in the first decades of the sixteenth century. Theminiature of the Pentecost is painted inside an illusionistic gold frame on a green ground, inscribed in lower edge: "D(OMI)NE LABIA MEA APERIES ET OS." The verso (originally the recto side) decorated with 2-line initials, line fillers, and border in right margin with foliates, flowers, and a heron or crane. Verso ruled in red ink for 24 lines, 21 lines written in Latin in a cursive bâtarde script in brown ink with rubrics in blue, with concluding prayers for the Hours of the Holy Cross, beginning "[...]future. Conditur aromate complen/tur scripture..." and ending "...Si michi solacium i(n) / mortis agone." There are some minor losses of paint and a small abrasion in lower right corner of the recto side, with minor cockling at lower edge of leaf and a pinhole sized tear, and otherwise in good condition with bright pigment. Unpublished. On the Fitzwilliam Museum leaf Marlay cuttings Fr. 12a-d, 13a-d, and 14a-d, attributed to the Master of Martainville 183, see S. Panayotova, ed., Colour: The Art and Science of Illuminated Manuscripts, 2016, cat. nos. 10 and 112. On the workshops of Jean Pichore with reference to the Master of Martainville 183, see C. Zöhl, Jean Pichore: Buchmaler, Graphiker und Verleger in Paris um 1500, 2004, pp. 46-47, 184-87, and 191-94.